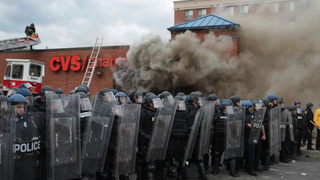 Police form a line in front of a CVS pharmacy that was burned during the protests in Baltimore April 27, 2015. The city of Baltimore is still reeling from the April 19 death of Freddie Gray a week after he was taken into police custody. Police officials have admitted that he asked for medical attention and never received it. Preliminary results from an autopsy revealed that Gray died from complications he suffered after his spine was nearly severed. On Monday Gray’s body was buried, and with few answers some 15 days after his death, the city burned. Protesters smashed and burned things, jumped on top of cars and screamed. They kicked things, grabbed broken parts and hurled them. They took things that were not theirs: Cheetos, sodas, convenience-store items. Police also reportedly engaged the protesters by throwing rocks. If the city is split into two sides—police on one end, rioters on the other—the death toll is still only one: Freddie Gray. Sorry if I am not tallying up the number of cracked windshields or pasteurized products to equal a life. I know how difficult it is to lose a life. When my grandmother died of old age, I was a teen and too young to comprehend anything, so I broke stuff in my room, anything. We all did. Wasn’t uncommon to hear something like glass getting smashed in my sister’s room in the middle of the night. We weren’t a violent family, we weren’t aggressive. We were broken, crushed. Imagine this for a second: I walk into your home with a baseball bat and crush your son’s larynx and break his spine. He dies a week later from complications. My father tells your family to calm down and stop acting like thugs. Now, tell me again about the agency of nonviolence and the peacefulness of protest. Didn’t take long for the tide to turn and the protesters to be called thugs by the black mayor. Are they not your constituents? Is the violence against CVS’ windows and police cruisers worse than the damage to Gray’s severed spine? Have any of the six police officers been called names after a man died in their custody? They will be given due process and a “fair” trial. So here is what this boils down to for me: I don’t care why looters are looting. I don’t care what they steal. I don’t care how many times you try to act as if they’re the criminals here. This is what I care about: I bet they have your attention now. When I was in grade school, a bully kept picking on this kid. One day he’d had enough. The bully knocked his glasses off and the kid went bananas. He was a windmill of punches. When the teacher broke up the fight, the kid who had been bullied looked up and said to the teacher, “I told you I was going to crush him if he knocked my glasses off again.” She looked stunned. And stunned is how Baltimore officials look now that the residents who have been mistreated by police are now on the streets burning and breaking things because they are tired. And this is what tired looks like. It looks like I’m done talking, and f—k your CVS. Doesn’t matter that the city doesn’t own it—it’s here in the community and we are poor, so this is what fighting back looks like: rocks vs. pepper spray, rocks vs. guns, Cheetos vs. death, video footage of teenagers giving the police the finger vs. video footage of a dead man’s last steps. When the house is on fire, you don’t spend time checking to make sure everything is right; you get out of that house. And Baltimore was on fire long before anything was set ablaze by the protesters. But I bet they have your attention now. I’m not fanning the flames; I am asking that those who are witnessing the blaze stop condemning those hurt by it. Fifteen days after his death, and we are no closer to understanding any parts of it than we were when it happened. This was prophesied long before us and will continue long after, unless the undercurrent is put to rest. Until all people in this country are treated fairly, the poor class will always revolt. Those left to grieve the dead will rage and protest, and those whose lives have not been taken, who cannot see themselves in this man’s shoes, will look on in horror and disgust at the men breaking windows at the convenience stores.